Illinois State alum Mark Grote is now a sports broadcaster in Chicago. The Chicago Cubs were more than just Mark Grote’s childhood team. As he grew up listening to Jack Brickhouse, Harry Carey, and other icons call games, Grote found a love of sports and sports broadcasting that are now his career. Grote’s relationship with the Cubs came full circle in 2015 when he joined the Cubs radio broadcasting team. It was a dream come true for the Illinois State grad. 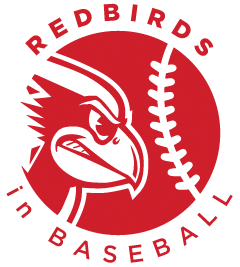 This story is part of Illinois State’s weeklong series Redbirds in Baseball. Grote’s move is the latest big step forward in a career full of interesting opportunities—in cities big and small, all over Illinois—since he trained at Illinois State’s School of Communication. While a sports reporter for WBBM, he traveled with the White Sox for their World Series season and with the Illini during their Final Four run. 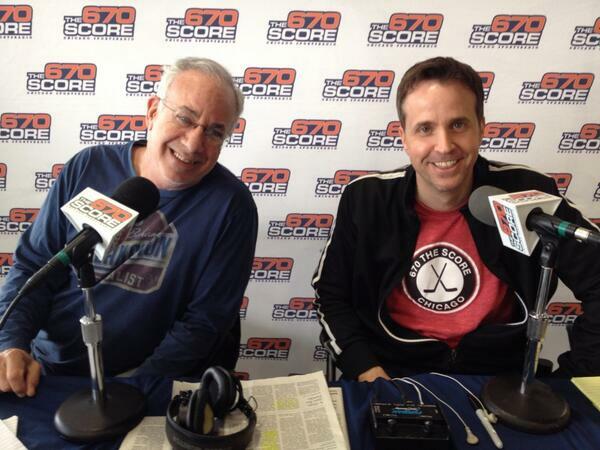 He’s also been a morning anchor on Chicago’s 670 The Score. Grote, right, with The Score co-host Steve Rosenbloom in May 2014. That led to full-time jobs in Lincoln (WVAX), where he loved being a “goofball” on his own morning show, and Springfield (WMAY), where he cut his teeth as a straight news reporter. Both would come in handy when Chicago came calling. Weekend fill-in gigs with The Score helped lead to that full-time sports position in 2002 with WBBM. In 2010, he jumped back to The Score. For more than 50 years, Cubs radio broadcasts were on WGN. 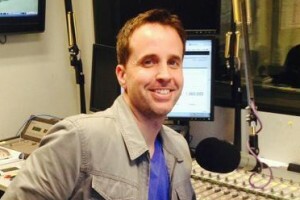 When the Cubs surprised many in 2014 with plans to switch to WBBM (The Score’s sister station) for the 2015 season, Grote knew he wanted the studio job. The Cubs (and Grote) will air on The Score starting with the 2016 season. Grote’s selection was announced in February 2015. His preparation for the job included reading up on all of the Cubs players and even traveling to spring training in Arizona for some face time with the team. He watched a ton of baseball already, so he knew the Cubs very well as it is. “I’m not coming into this cold, but I feel like I have to know them at a different level,” Grote said. He’ll be traveling with the team the entire season—including 81 games on the road, plus the possibility of the playoffs—a grueling day-to-day schedule of prep, show time, and repeat. But Grote wants to keep it light. From his days in Lincoln to his mornings laughing with Mully and Hanley on The Score, that’s the sweet spot for Grote.